Covering remarkable joints and permanent joints in most common metallic and non-metallic materials, this book offers a valuable selection tool for the professional engineer. 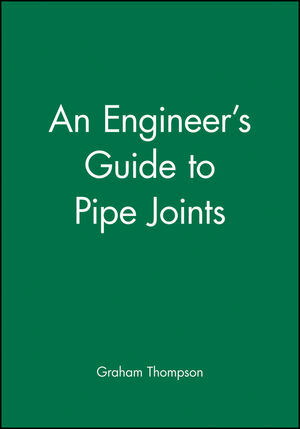 An Engineer’s Guide to Pipe Joints will be useful to all those involved in process, chemical, fluid and materials transport engineering as well as any engineer concerned with pipe work and joints as part of an installation. Chapter 2. Pipe joint selection. Chapter 3. Metallic flanged joints with gaskets. Chapter 5. Flanged joints without gaskets. Chapter 6. Malleable iron pipe fittings (screwed fittings). Chapter 8. Welded metallic joints. Chapter 10. Joints in glass piping. Chapter 11. Joints in lined metallic piping. Dr. Graham Thompson MSc, PhD, CEng, FIMechE is an experienced author and researcher in plant equipment evaluation, design, maintainability, and reliability. He has published extensively in this field. He is a Vice Chairman of the Process Industries Board of the Institution of Mechanical Engineers and is a member and past chairman of the Process Industries' Design Committee. He holds a Senior Lectureship in the Department of Mechanical Engineering, UMIST, UK.